Since No Two Taste the Same, You'll Have to Try Them All! When you think New York City landmarks, you might imagine places like Central Park, Coney Island, or City Hall. All these sites are popular stops on any trip to New York City, but let’s be honest: C is for cookie. This cookie shop serves freshly baked cookies the size of your fist (well, six ounces of dough to be exact). Four types are baked to order and no trip here is complete without trying each of them: chocolate chip walnut, dark chocolate chocolate chip, oatmeal raisin, and dark chocolate peanut butter chip. The price tag is well worth it for one of New York’s best cookies. Tuck into the sweet treats at any one of the locations in NYC. Check the Levain Bakery website for the most up-to-date information on locations and hours. This bakery chain is aptly named considering they're open and delivering to N.Y.U. dorms and area residents until 3am. There are 11 types of standard warm and chewy cookies on the menu, but we suggest trying one of their three deluxe cookies for maximum satisfaction: chocolate peanut butter cup, triple chocolate chunk, or s'mores. Whether you’re cramming for finals or just hanging out with your friends, there’s no better late-night snack to appease your sweet tooth. Just remember to brush before you go to bed! Check the website for the most up-to-date information on locations and hours. Although this Union Square spot boasts a salad bar and serves a variety of soups, their cookies are not to be missed. 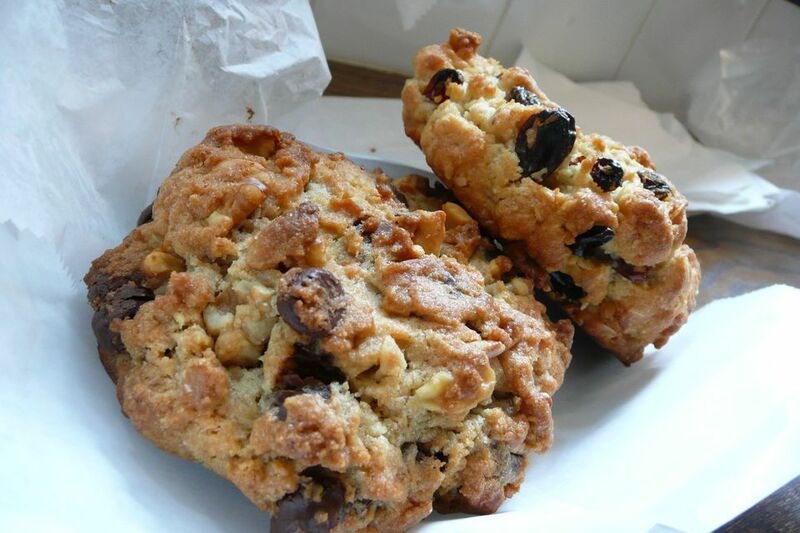 The chocolate chip cookies and oatmeal raisin cookies taste best with a cup of their signature hot chocolate. Swing by in February during their annual hot chocolate festival, which features varieties like banana peel hot chocolate, cinnamon-black pepper hot chocolate, and even beer hot chocolate. If you still have room, make sure to try their homemade marshmallows. Check the website for the most up-to-date information on hours. The sweet shops of famed chocolatier Jacques Torres serve up three types of cookies: a classic chocolate chip cookie, a double chocolate mudslide cookie, and an oatmeal raisin chocolate chip cookie. No matter which you decide to try, make sure to ask for it warm. Be prepared for chocolate to ooze out of these chewy treats; wash it down with a cup of frozen hot chocolate—a great combination for a warm summer day. Check the website for the most up-to-date information on locations and hours.